Jobu talks about what it meant for him to see CC Sabathia choose to sign an extension with the New York Yankees. In case you guys haven’t heard, or watched CC Sabathia’s own Youtube video (you can do the latter at the bottom of this post), The Yankees announced on Monday that they had signed their ace to a contract extension. That’s right. After months of speculation as to whether he would opt out and look for the largest contract ever given to a pitcher (again), CC didn’t do what almost every “expert” (Jobu included) thought he would do. I will say that I felt in my heart that CC would come back to the Yankees eventually, but i thought for sure he would opt out and cash in on a bidding war for his services. I am so proud to say how wrong I was, and I am excited to see what this new contract will bring CC and the Yankees. 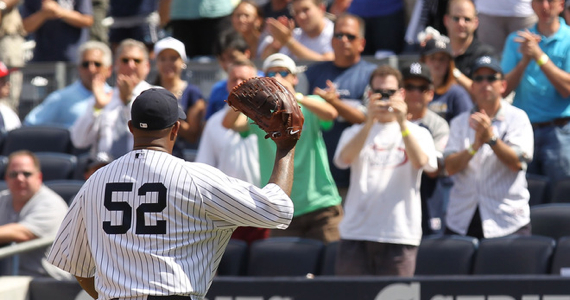 Does Sabathia Deserve This Extension? Without a doubt, Sabathia has been the Yankees ace for the last three seasons, but should he have just honored the original seven year contract he signed? This is what I say to that… The original contract was designed to give Sabathia an out in case he hated New York, or if the pitching market changed. While neither of those two things happened, he also didn’t opt out of the deal, or even threaten to (at least publicly). Sabathia has proven himself to be a complete team player in every stop of his Major League Career. In Cleveland, he was a workhorse. In Milwaukee, he basically put the team on his back and carried them to the playoffs, pitching on three days rest for the entire last month of the season despite being on the cusp of free agency. When the Yankees gave him the record setting contract he earned on the Brewers, he brought that same selflessness and commitment to winning with him to Yankees Stadium. We all remember the 2009 World Series run when Sabathia (and the rest of the staff) pitched the entire playoffs on three days rest en route to the Yankees 27th championship. In his three years as a Yankee, Sabathia has won 59 games with a 3.18 ERA, a 1.12 WHIP and averaged 235 innings and 208 strikeouts per season. He has been a leader both on and off the field, and has established himself as a pillar of the community, and he deserved to get a couple of years added to his deal for his sacrifices and accomplishments. What Does This Extension Mean For His Career? 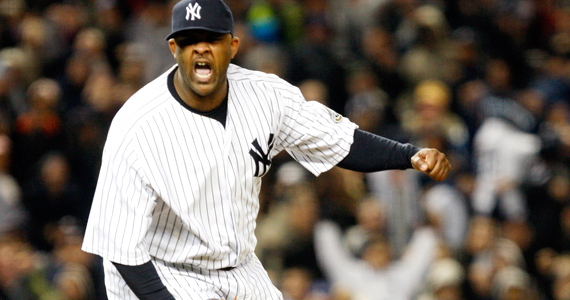 Sabathia will give Yankees fans a lot to cheer about over the next six years. This extension does a lot for Sabathia’s career. From the obvious department, this new extension gives him financial and locational stability. He knows that he and his family will be in New York until at least 2016 (2017 if his shoulder remains healthy and the option vests), and he knows that they’ll be rich beyond his wildest dreams growing up in a single parent home in Vallejo, CA. In the greater, more historical sense, this contract could do a lot for Sabathia. If Sabathia remains healthy and makes it through all six years of the agreement, he should put himself on the cusp of 300 wins by the time it runs out. Sabathia has averaged almost twenty wins per season as a Yankee, and sixteen per year overall. The Yankees will always have the money needed to put a good team on the field, and there’s no doubt that CC could average 17 or 18 wins per season for the duration of the deal. That would give him somewhere between 102 and 108 wins in those six years, which would give him between 278 and 284 wins entering his age 37 season in 2018. If healthy, there’s no reason to think he won’t play a couple more seasons and reach 300 easily (in pinstripes or elsewhere). If he continues to average his 200 Ks, he’ll finish the contract with over 3,200, which will be good enough for 12th all time. Add up the wins, the Ks, and the yearly trips to the post season, and Sabathia’s contract will surely make him an obvious selection for the Hall of Fame whenever he decides to hang them up. I’m not saying he wouldn’t put up those numbers elsewhere, but things always look more impressive in pinstripes. What Does This Extension Mean for the Fans? I can speak for Yankees fans in this post because, first and foremost, I am one. I have watched the Yankees sign countless free agents in my time as a fan. Some worked out, some didn’t at all. Usually, the Yankees end up overpaying for players who underproduce and let them down. With Sabathia, I can tell you that they got back every penny they have spent on the big lefty the past three seasons. I can also tell you that Sabathia choosing not to opt out of his deal and pursue free agency has slightly restored my faith in the professional athletes I root for. Sabathia could have pulled an A-Rod, opted out of the deal and leveraged the Yankees for an astronomical amount of money and more years (A-Rod is owed $147MM for the duration of a contract that keeps him on the Yankees until well past his 40th birthday). Instead, Sabathia simply asked the Yankees for a show of faith and gratitude for three incredible years, and accepted the fair offer when he received it. He never wanted to leave, and the Yankees made it easy for him to stay. As a fan, I can only hope that Sabathia stays healthy for the next six years and accomplishes everything this contract sets him up to accomplish. I want this not only for Sabathia, but for myself and the Yankees too. If Sabathia pitches like he can for the next six years, and Cashman continues to build a great team around him, we’ll all be celebrating a lot of World Series Championships together in the years to come. I can’t wait to see him on the Yankees Stadium mound about 200 times over the next six seasons. It will be an honor and a pleasure. This was an obvious signing for the Yanks as they could not let their most dependable pitcher get away. I can see C.C. becoming another David Wells, one of those big ol’ left handers who just keeps going on and on. Definitely a no brainer. I felt like as long as he didn’t want something crazy like 8 years, then they had to bring him back and would. I can only hope he’ll be another David Wells. I’d love to see him sign on for a couple years after this deal (assuming he’s healthy) so that he can try to get his 300th win as a Yankee.